Home » alexandre philippe , chad austin , ed woody , forcery , george lucas , kwerky productions , melody hallman daniel , movies , star wars , the people vs george lucas » THE PEOPLE VS. GEORGE LUCAS hit DVD this week! THE PEOPLE VS. GEORGE LUCAS hit DVD this week! 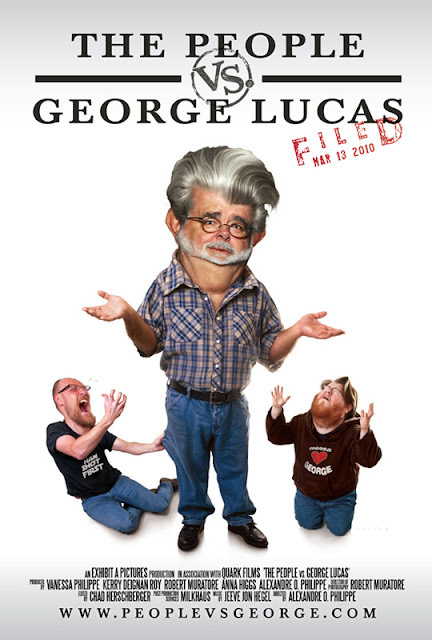 But I got to see it last month at a/perture cinema in Winston-Salem, along with Forcery co-producer Ed Woody and star Chad Austin, who appears a LOT throughout The People vs. George Lucas as, well... George Lucas! The screening was on September 12th. Why didn't I write about it sooner? Because it still hasn't sunk in yet: that was my film Forcery, the idea for which hit just over ten years ago (I began writing the script on the night before 9/11), and my most life-long best friend playing George Lucas on the big screen as part of this multi-award winning documentary that has played at film festivals all around the world! But as surreal as the experience was, that was mild compared to watching Melody Hallman Daniel's performance as Frannie Filks from Forcery, which The People vs. George Lucas is exceptionally peppered with! In fact, director Alexandre Philippe has told me that at every screening he has attended around the globe, that Melody's performance is a huge hit and has never failed to arouse cheering and clapping. There certainly was at the screening we attended last month! In fact, her rant about "Greedo never shot first!" even made it into the pages of Time Magazine this week! Apart from seeing our own lil' film in it, The People vs. George Lucas is quite an intriguing work examining the Star Wars phenomenon, its creator and the love/hate relationship that Lucas has enjoyed(?) with the saga's fans (particularly since the Special Editions started the "retconning" ball rolling in 1997). Philippe doesn't take any decisive sides in his film, but rather lets the viewer decide on his or her own. As far as this viewer is concerned, I learned quite a few new things... as well as was led to consider quite a lot of what it means to be a Star Wars fan from a fresh perspective. It's a fascinating film, and it's now available on DVD at Amazon.com and probably a few of the big box retailers. Highly recommended!